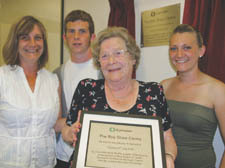 FAMILY, friends and comrades of the late Labour councillor Roy Shaw gathered on Tuesday to name a new Town Hall office after him. Cllr Shaw, who served for 51 years, died earlier this year and the council have named a new call centre and computer HQ in Cressy Road, South End Green, after the popular politician. Born in the borough, Roy was elected to Hampstead Council in 1956 and then served on Camden from 1965 until 2007. He was made an honorary alderman of the borough when he stood down owing to his ill health. Labour group leader Anna Stewart unveiled the plaque with council leader Lib-Dem Keith Moffitt and was joined by members of Cllr Shaw’s family. Roy’s sister Pam Downey added: “I am so proud his memory is being honoured in this way. He’d be happy about it.